Picking up a book and reading the words is the easy part. Reading to understand is much harder. The key is not simply to read more but rather be selective about what we reading and how we are reading. This article, the first in a multi-part series on improving our reading skills, outlines the four levels of reading. 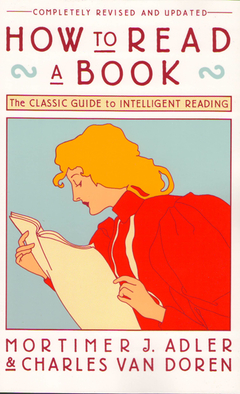 Mortimer Adler originally published How To Read A Book in 1940. It immediately became a bestseller. Since that time the book has been updated and recast many times, most notably by Charles van Doren in the 1970’s. There is no such thing as passive reading. All reading, to some degree, is active reading. The only difference is that some reading is more active than others. And when it comes to reading to learn something or reading for information something the more active your reading habits the better. Reading is a complex activity, just as writing is. It consists of a large number of separate acts, all of which must be performed in a good reading. The person who can perform more of them is better able to read. Success in reading is determined to the extent that you receive what the writer intended to communicate. That doesn’t mean you agree with them, only that you understood them. Assuming we’re not reading for entertainment, there are two things we generally want to get from reading. We can read to acquire information and facts or we can read to learn something new and improve our understanding. Reading for entertainment is self-explanatory. Reading for information is the one in which we read media or anything else that’s easily digestible. These things give us more information but don’t improve our understanding. There is no shock, no moment of … that doesn’t make sense. Alternatively, we can try to read something by someone who knows more about the subject than we do. After reading works by authors who know more about a subject than we do, our understanding is changed … it may be the case that we better understand something or perhaps we understand that our understanding was incomplete. Either way, our understanding has changed. The easiest way to improve our understanding is from people who understand more about the subjec than we do. So half the battle of reading for understanding is to identify and select works from someone (or a group of people) who know more about a subject than we do. The internet and Amazon have made this much easier with ratings and book reviews. And if you can read for understanding, you need not worry about reading for information or entertainment as, being less demanding, they will take care of themselves. This is the difference between being knowing the name of something and knowing something. … if you remember what an author says, you have learned something from reading him. If what he says is true, you have even learned something about the world. But whether it is a fact about the book or a fact about the world that you have learned, you have gained nothing but information if you have exercised only your memory. You have not been enlightened. Enlightenment is achieved only when, in addition to knowing what an author says, you know what he means and why he says it. You can’t be enlightened unless you are informed, however you can be informed but not enlightened. The first is the ignorance of those who, not knowing their ABC’s, cannot read at all. The second is the ignorance of those who have misread many books. The Greeks had a name for people who have read too widely and not well, sophomores. Being widely read and well-read are not the same thing. Adler argues that to avoid this error we must distinguish between how we learn into instruction and discovery. The art of reading, in short, includes all of the same skills that are involved in the art of unaided discovery: keenness of observation, readily available memory, range of imagination, and, of course, an intellect trained in analysis and reflection. The goal of reading determines the best way to read the material in question. If we’re reading for entertainment, we’re going to read a lot differently than if we’re reading to build a rocket ship. A thorough understanding of the levels of reading is necessary before we can improve our reading skills. There are four levels of reading. They are thought of as levels because you can’t reach the higher levels without a firm understanding of the previous one — they are cumulative. The first level of reading is elementary reading, which is what we learned to do in elementary school. Most of us never get beyond this level. Other names might be rudimentary reading, basic reading or initial reading; any one of these terms serves to suggest that as one masters this level one passes from nonliteracy to at least beginning literacy. In mastering this level, one learns the rudiments of the art of reading, receives basic training in reading, and acquires initial reading skills. The second level of reading is inspectional reading, which can be thought of us intelligently skimming a book in a limited amount of time. Not only does this prime our brain with the material in the book, but it helps us determine if we want to read the entire book. [A]nother name for this level might be skimming or pre-reading. However, we do not mean the kind of skimming that is characterized by casual or random browsing through a book. Inspectional reading is the art of skimming systematically. The point of inspectional reading is to examine the “surface” of the book. Inspectional reading is underappreciated by a lot of readers because they see it as a waste of time. A lot of people like to read linearly. They pick up a book, turn to page one, and plow steadily through it without ever reading so much as the table of contents. “They are,” writes Adler, “thus faced with the task of achieving a superficial knowledge of the book at the same time that they are trying to understand it.” This makes reading more difficult, not less. The third level of reading is called analytical reading, which goes deeper than inspectional reading. If your goal in reading is entertainment or acquiring information, analytical reading is not necessary. However, if you are reading to improve understanding, analytical reading is entirely necessary. It is both a more complex and a more systematic activity than either of the two levels of reading discussed so far. … Analytical reading is thorough reading, complete reading, or good reading— the best reading you can do. If inspectional reading is the best and most complete reading that is possible given a limited time, then analytical reading is the best and most complete reading that is possible given unlimited time. The analytical reader must ask many, and organized, questions of what he is reading. … [A]nalytical reading is always intensely active. On this level of reading, the reader grasps a book— the metaphor is apt— and works at it until the book becomes his own. Francis Bacon remarked “some books are to be tasted, others to be swallowed, and some few to be chewed and digested.” Think of analytical reading as chewing and digesting. The fourth and most difficult level of reading is syntopical reading. It is the most complex and systematic type of reading of all. It makes very heavy demands on the reader, even if the materials he is reading are themselves relatively easy and unsophisticated. Another name for this level might be comparative reading. When reading syntopically, the reader reads many books, not just one, and places them in relation to one another and to a subject about which they all revolve. But mere comparison of texts is not enough. … With the help of the books read, the syntopical reader is able to construct an analysis of the subject that may not be in any of the books. It is obvious, therefore, that syntopical reading is the most active and effortful kind of reading. This is the first article in a multi-part series on how to improve our reading skills.